$214. 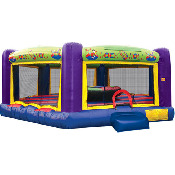 The Rock N Roll inflatable is an extra large inflatable with an elevated color wheel in the center. The Rock N Roll inflatable has a bright and beckoning exterior, and a dizzying red- and blue-striped interior floor perfect for celebratory jumping, giving it the draw power for hours of traffic.